HOBART: The Branch has no ATDP qualified Welfare Officers or Compensation Officers. NOTE: The Veterans Indemnity & Training Association (VITA) insurance cover limits the age of Practitioners to 85 years of age. The RSL has determined that 80 years of age is their cut-off but the RAAFA is prepared to consider Practitioners over 80 but under 85 on a case by case basis. Any case for such consideration must be addressed in the first instance, to the State Secretary. We do need volunteers to be trained as Pension and Welfare Officers. The veteran community is aging and their needs are inceasing. Trained Welfare and Pension Officers are urgently needed to help cope with the increasing workload in this important are. Members intersted in asisting in this regard are asked to contact the State Secretary. The Advocacy Training and Development Program (ATDP) is making strong headway. All Advocates and Practitioners are now encouraged to have their training formally recognised under the Recognition of Prior Learning (RPL) program and also as Advocates able to undertake the Mentoring of new Advocates who will come on-line. Under the provisions applying to a Registered Training Organisation (RTO) all Advocates will be accrediated as qualified members of the ATDP and will then be fully covered by insurance to practise. Military personnel are frequently employed in high-risk situations that occur on operational deployments, during training and in peacetime service. These days risk assessments are conducted to determine the hazards and identify how they can be mitigated. Formal risk assessment did not commence until the early 1990s and even then, awareness of certain risks, especially those relating to chemical exposure was relatively unknown. The RAAF Fireman mustering, now termed Firefighter, was created in 1956. These airmen received basic mustering training at the RAAF Fire School situated at was then called RAAF Base Point Cook. Also, an unknown number of ARMY and Navy firemen were trained at the site. Training at Point Cook ceased in 1986 and recommenced at RAAF Base Amberley in 1987. In the late 1990s, early deaths of former RAAF Firefighters who suffered unusual health conditions prompted investigations by concerned former members of the mustering. Soil testing at the Point Cook site revealed 132 toxic chemicals were present, which was a probable cause of the airmen’s deteriorating health conditions. A range of combustible, extremely toxic fluids and materials were used to create significant fires for training purposes. Personal protection equipment in those days was minimal and rarely used, mainly due to the ignorance of the serious potential health risks associated with exposure to the substances and expelled vapour. At least nine formal investigations (six directed by DVA) into the relationship of the chemicals used and their health side effects have been conducted. However, at this point, there is no medical-scientific evidence of a correlation between these substances and the health conditions of these Firefighters. Nevertheless, their exposure to toxic chemicals is undeniable. There is a likelihood exposure may have extended to members of their families. The Air Force Association recently became aware former Firefighters’ claims for recognition of their health conditions based on their training and employment had been unsuccessful, and that some TIP trained Welfare and Compensation Officers were dissuading other former Firefighters from submitting claims because of previous unsuccessful attempts for recognition and acceptance. 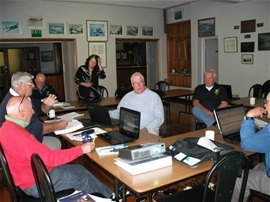 Earlier this year, the Association decided it would support the RAAF FIREFTG Group, representing former and serving Firefighters, with its negotiations with DVA. The Air Force Association, working with DVA and the RAAF FIREFTR Group, will provide advocacy support in the form of case management to all ADF firefighters who believe they suffered exposure to toxic chemicals during their training and employment. This tripartite relationship aims to ensure ADF firefighters will have their claims processed for all diagnosed health conditions so they can accurately be assessed for entitlements. The Association strongly encourages all ADF personnel (regardless of Air Force Association membership) to register their interest in submitting a claim with Ted Mildren of the RAAF FIREFTR Group at raafa.advocacy@gmail.com. The Air Force Association aims to ensure former and current serving members receive the best possible assistance in submitting claims for recognition of their Service related injuries and/or health conditions and navigating the DVA network and claims processes. Many former and serving ADF members who are in receipt of DVA entitlements have benefited from the voluntary work of trained Advocates. This resource is diminishing due to the advancing ages of many current Advocates. The Association will be calling for volunteers to take up the Advocacy Training and Development Program that provides training in Military Advocacy to provide this essential service to our service colleagues and their families.